Chana masala (or chickpea curry) is an Indian staple, Made with a delicious mixture of chickpeas, Indian spices, tomatoes, and fresh herbs, it’s tasty and so easy to make. Enjoy it with a bowl of rice, quinoa, naan, or in a Buddha bowl! Chana masala (or chole) is an Indian dish made with chickpeas (garbanzo beans), a blend of Indian spices, tomatoes, and fresh herbs. It’s typically enjoyed in India with a delicious and fluffy bread called batura – called chole batura when served together. Not only is it easy to make, it’s delicious and filling! You can also use garam masala but I know that’s not as easy to find, so I skipped it in this recipe. It still tastes just as delicious! 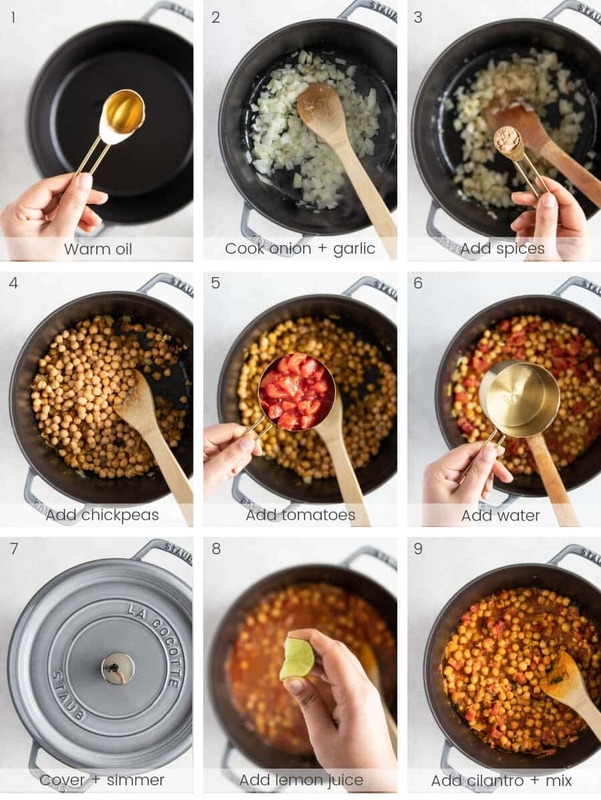 While chana masala served in most restaurants can contain a lot of oil, homemade chana masala is made with a few ingredients and a handful of spices. You can make it on the stovetop or even your pressure cooker. In a big pot, warm some oil. While butter is traditionally used, I prefer to opt for avocado oil. Add diced onion and a couple cloves of garlic. Cook this on medium-low heat until the onion starts to appear translucent and smells fragrant. You don’t want the onion or garlic to burn. Add the spices, all of them! Stir well and let them cook for a minute or so, until they are fragrant. Add the chickpeas, tomatoes, and water. Stir and bring the dish to a simmer. Cover the pot and let the dish cook until the chickpeas are soft and tender. If you feel like there is too much liquid, simply simmer it without the lid to evaporate the water. Add the lemon or lime juice — this is key and will give it that delicious tangy flavor. Add the fresh cilantro and stir, turning off the heat. Serve and enjoy. If you want to save it for later, be sure to completely cool down the chana masala before storing it in the fridge in an airtight glass container. So should you use canned or dried chickpeas? Using dried chickpeas is usually the way to go. I use the Instant Pot to cook my chickpeas. I store them in a airtight glass container and use them throughout the week in various dishes throughout the week. However, I realize that it’s not always convenient to cook your chickpeas. For that reason, I suggest having a few cans of organic chickpeas on hand. Be sure the cans don’t use a BPA lining and always be sure to check out the ingredients list to make sure you’re just getting chickpeas. In a bowl! 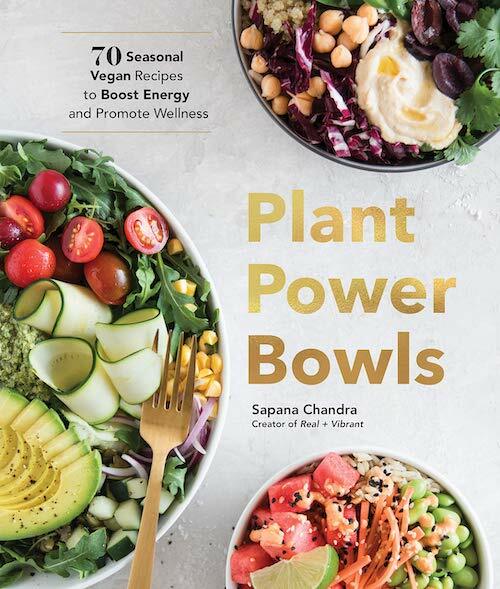 I love eating it in this chickpea nourish bowl. No matter how you decide to enjoy it, I hope you love this childhood favorite of mine! Masala Potato Salad – not exactly Indian but definitely Indian-inspired! Chana masala (or chickpea curry) is an Indian staple, Made with a delicious mixture of chickpeas, Indian spices, tomatoes, and fresh herbs, it’s tasty and so easy to make. In a big pot, warm oil on medium-low heat. Add the diced onion and a couple cloves of garlic. Cook the onion and garlic on medium-low heat until the onion starts to appear translucent and starts to smell fragrant. Add the cumin, coriander, turmeric, paprika, salt, and pepper. Stir well and cook for a minute the spices become fragrant. Add the chickpeas, tomatoes, and water. Stir and bring the dish to a simmer. Cover the pot and let the dish cook until the chickpeas are soft and tender, for about 30 minutes. Once ready, if you feel like there is too much liquid, simply remove the lid and continue to simmer until the dish is at the desired consistency. Turn off the heat and add the lemon or lime juice. Add the fresh cilantro and stir. Always a favorite and reminds me that I havent made chana masala in a while! Loved all the pics.